When I was at Convention in SLC a few months ago - the idea to use the Spooky Spider Decor Elements on a glass jar was presented during one of the classes. I had bought the larger sized image and a large jar - only to find out my jar was too small for the Spider Image I purchased. I was thrilled that SU released these Decor Elements in a smaller size. I used the Small Spooky Spider image (item 114761, $5.95) on an Anchor Hocking Glass Jar (item #69349)I picked up at Target, and it fits perfectly! 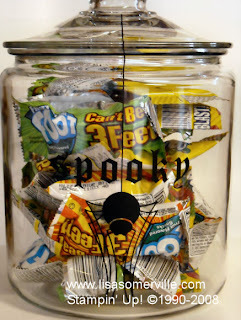 Luckily for me I don't have Halloween Candy in the house yet, or my DH and boys would have eaten it already, so I filled my jar with Fruit Snacks. The Spooky Spider Decor Elements is a limited time offer, and will no longer be available after October 31, 2008, so order yours today! You can email me to place your order, or order directly from my website.